Having met the rest of the group the night before at the impressive Lumley Castle, we set off after breakfast with David and Susann for Hadrian’s Wall. The weather was bright and sunny with clear skies. Unfortunately, as we drove along the wall, the skies darkened and it became so cold and windy that we had to stop and put on hats, coats and gloves! On arrival at Chester’s Fort our first stop was a hot chocolate in the cafe to warm up! The fort has the best-preserved Roman military bath-house in the country and was home to five hundred cavalry horses and their riders. We spent a very pleasant morning wandering around the ruins where there were very informative and illustrated boards at each stop. After leaving the fort we had a fast and enjoyable scenic drive to Rothbury. Luckily the weather had improved and we arrived at Cragside in time for a sandwich in the sun before going round the house and gardens. Cragside is the house where Victorian inventor Lord Armstrong lived and was the first building in the world to be lit by hydroelectricity. The property is full of amazing gadgetry including a Turkish bath suite! The gardens are extensive and contain something for everyone, old and young. We spent a happy afternoon exploring before making our way to our next hotel Doxford Hall. Having travelled north the previous day we met up with fellow TOC members for the Beamish Run. For those unfamiliar with this event it follows some of the vehicle trial and test routes of the 1920’s and 30’s and has been held annually for the last 45 years. Four Talbots took part, driven and navigated respectively by David and Susann Cook, (our organisers), Martin and Hilary Bryant, Rowley and Janet Grindell and ourselves. We all signed on and left more or less in convoy. Whilst navigation was not too arduous, (though occasionally thwarted by over-enthusiastic driving on my part), the route took in many and various narrow lanes with lots of steep hills, both up and down. Quite a challenge, especially for the brakes which were beginning to fade on a particularly long and steep descent which ended abruptly with a T junction. Not for the faint hearted! The Run took in “observed sections” to check on one’s driving ability or otherwise and a series of checkpoints where you were quizzed on your knowledge of the more arcane aspects of all things to do with vehicles and the Highway Code. This exposed a quite startling lack of knowledge on my part, only partially alleviated by the heavy hints given by the marshals. However, we all made it to lunch to compare notes and partake of our picnic, liberally augmented from a seemingly inexhaustible stock of goodies provided by David and Susann. Much refreshed and now well into the spirit of the thing, we completed the next section which concluded with tea and cakes. Perhaps, in hindsight, we were a little too enthusiastic in our participation in this part of the day as we suddenly found ourselves all alone and facing the possibility of finishing last. I don’t think we are in line for any awards, but we had a very good time. 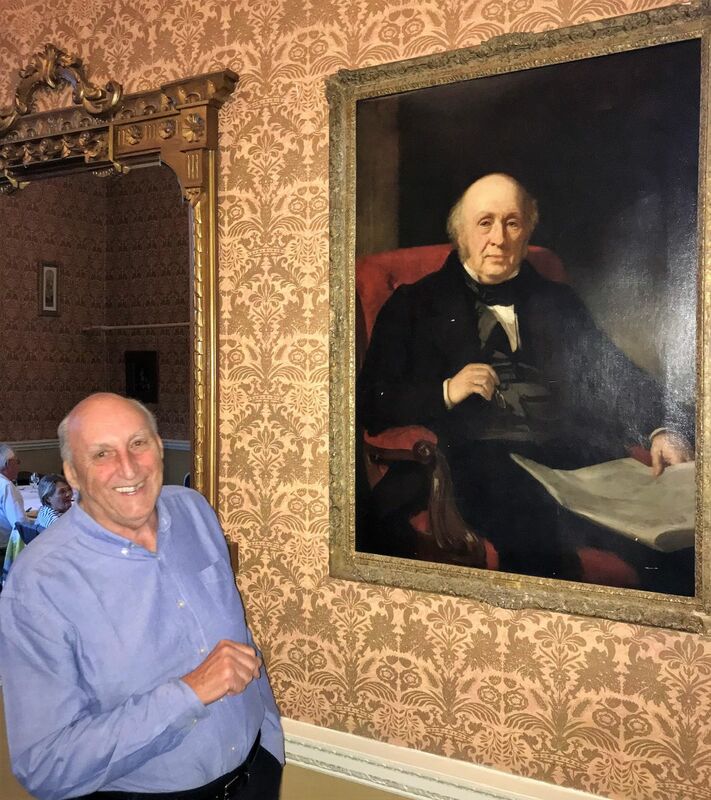 The day concluded with everyone meeting for dinner presided over by the benign presence of (surely) one of Rowley’s noble ancestors (see photo). The Beamish museum, ‘The Living Museum of the North’, comprises a number of recreated scenes and activities from the Edwardian period, all encircled by a working tramway. We started by taking the open top tram to “town”, passing a demonstration of horse ploughing. “Town” comprises a fully recreated street with period shops and services. The “dentist” was very soon spotted by Janet and having dentistry connections, a visit had to be made. Here we discovered that in the Edwardian period and earlier, young women would have all their teeth removed and replaced by dentures, in order partly to enhance their appearance, but more importantly to present themselves as “low maintenance” to potential suitors! Next we visited the station, appropriately named “Rowley”! This station had been removed from a village of that name and was typical of the sleepy, pre-Beeching, rural station. But, of course, no trains were running. Seeing the baker nearby, iced buns were demanded and carried off along the street to the “Alhambra” style tea rooms, or perhaps it was “Lyons”. Along the street, past the ironmongers and general stores, full of those galvanised buckets and watering cans you never see these days; and rapidly past the dresses with minimalist waists, to the “Cycle and Motor” emporium. An Aladdin’s cave of High Wheelers and Safety bicycles and motor accessories of all kinds, including Pratt’s Motor Spirit by the can. A Cyclecar was on show. This was a little like a pedalo with a cycle wheel at each corner and driven by a single cylinder air-cooled engine. Apparently six were made locally, but at a cost of £100 each, did not sell as they were too expensive for the intended mass market. With a choice of places to visit we chose to visit the winding stage. Here a retired miner explained the workings of the mine and coal seams and the closure of mines in different areas, adding some asides “I’m not political – we were misled by our leadership”. The winding gear was interesting as it was driven by a beam engine with the beam fixed at one end, rather than centrally. This had been working, but unfortunately not while we were there. The mine had been 400 ft. deep with galleries and seams at 100 ft. intervals down. By this time, we had been on site for nearly five hours and, with much more to do and see, we decided to leave the rest for another time. A thoroughly interesting museum with interest for everyone. This is to be our last full day here in the North East so it was with some reluctance that we packed up after two nights at this very comfortable hotel. We decided that we would go into Alnwick to explore the Castle gardens and in particular the Poison Garden that I had been aware of through Aromatherapy. Another lovely day for travelling, we took the back road into Alnwick from the north over the River Aln into the centre of this delightful and attractive ancient town. Following the signs for the garden we passed a high stone wall in which was set the most beautiful wrought iron gate with a design made of vines, flowers and birds – it encourages you to go close and even touch, which initiates the birds to sing! This is the gate through which Jane, Duchess of Northumberland brings her own guests from the castle into her garden. We took the advice of joining a guided tour. So glad we did as I am sure we would not have enjoyed or understood the ethos of the gardens. They are designed for, and indeed used by, the people of Alnwick. Set on a slope, the first thing you notice is the centrepiece of the gardens, the waterfalls and fountains which are stunning, particularly when they start one of their timed sequences. We were led firstly to the rose garden, which would have been in full flower and scent if things hadn’t been delayed by our late, cold spring. Wander on and you come to an orchard of over 230 very rare Japanese cherry trees with swings under them – just imagine swinging when they are in full bloom! You finally come to the Poison Garden which is enclosed with a locked gate. Entrance is available only with a guide, only one group at a time, on a rolling timetable. Once inside you are surrounded by familiar plants and flowers some from gardens and some from verges and hedgerows with information on the effects they can have, good or bad. You realise how unaware and detached we have become from our natural surroundings. Do we know how deadly rhubarb leaves are? That if docks are not available to relieve the sting of the nettles, tooth paste will do the trick as it contains the same chemicals as the dock! Two plants were caged, cannabis and khat, to prevent us taking leaves to smoke or chew!! We left the gardens and Alnwick behind us, heading for Rothbury and a coffee. 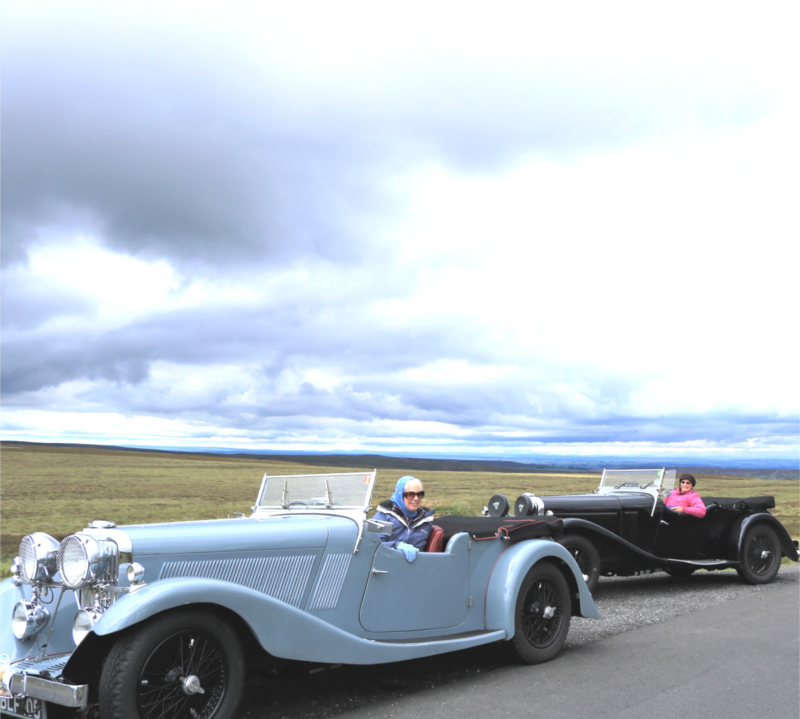 A super drive crossing the River Coquet climb to Gatleigh Moor and along an undulating road – wide open views of hills and Harwood forest. Getting used to the big skies and the wide openness of the moors – a very big version of our own Exmoor. On we went to Forestburn Gate, over the river Font, a passing glimpse of Fontburn Reservoir, seeing too the remains of dismantled railways and industrial buildings – to Rothley Cross, Cambo past Wallington House and gardens that some have planned to see, until we meet the A68 to turn to Corbridge through really open country, along straight Roman roads, over Hadrian’s Wall at Port Gate (part of St Oswald’s Way is here too) and into Corbridge; an attractive town with just one bridge across the Tyne and head on via lovely wooded roads through Strother Dale, Slaley Forest on one side and Derwent Reservoir and Dale, the other dropping gradually into Blanchlands and the Lord Crewe Arms. The village is frozen in time and still owned by the Crewe family. We were the third to arrive; Tim, Paula, David and Susann were already there. We found a long table on which to have lunch. Gradually others arrived, including Chris Salmon, until we had quite a crowd, all enjoying the company and meal. We then took up David’s challenge to literally go over the hill and far away to Westgate via Huntstenworth Moor, Cuthbert’s Hill down into Lintzgarth – what a wonderful driving road with superb views, over 500 metres at the highest point, which meant we could see for miles on this lovely clear day. From Lintzgarth it was over the Burn, zigzagging up the common towards Scarspike Head along the top again. A brilliant road to drive, Tim and Paula long gone ahead of us, to drop down quickly into Westgate, passing old disused mines. Not finished yet, turning right and left, crossing the River Wear to climb again between High Pike and Back Hill to the top at Swinhope Head at 607 metres – wonderful, wonderful views west over Langon Common and east over Middleton Common to drop down through Newbiggin Common and wiggle into Newbiggin itself and find our way through Teesdale following the River Tees. 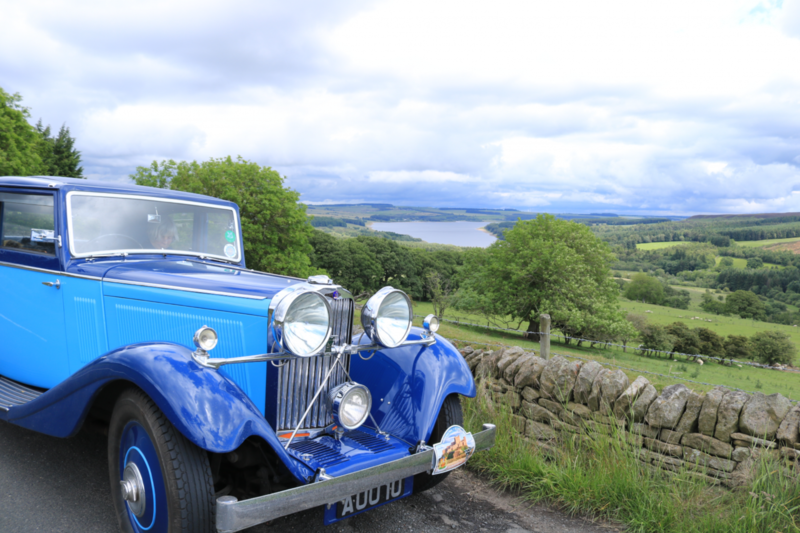 We fuelled up in Mickleton and caught up with the others for tea at the Rose and Crown in Romaldskirk. We all felt we had had the drive of our lives! From Romaldskirk we found our own way to Headlam Hall Hotel which was only a stone’s throw from David and Susann’s lovely home in Winston. Another well-chosen hotel; this time many of us took advantage of their spa facilities to have a swim and a spell in the hot tub before our final meal together. Another happy evening – good food, good company and all safely in. Martin Bryant gave the “Thank you” speech and presented the gifts for both David and Susann on all our behalf. A fitting end to a wonderful, happy few days in the beautiful North Eastern area of our own very diverse Country. Glorious weather had blessed us all the way: wonderful roads to drive, free from traffic and great company, lovely comfortable hotels. What more could one wish for? I would like to add add Malcolm’s and my huge personal thanks to David and Susann for a fantastic Tour, their hospitality and most of all, for entrusting their lovely 105AV James Young Saloon AUU 10 to us for the full 4 days. She behaved beautifully and we hope she benefited from her holiday as well!